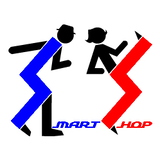 SMART SHOP was established in 2004 it is now celebrating its 14th Year. We imported punk items at first from the U.K. and sold them in Japan. However, unfortunately many London punk items are reproduced in Japan. SMART SHOP have much respect for London punk as British culture. Therefore, we do not produce copies of London punk. Nearly every our item has been affected in some way by punk. We do not exactly sense that our item is consciously Japanese elements. However, we are really happy whenever foreign people who look at our work say that these designs are Japanese elements, because we think it is natural that a design made by Japanese activist should sense Japanese elements. You cannot find our item anywhere else. We do not sell wholesale to other suppliers, we do direct sales only. Please feel free to contact us anytime if you have any questions.